A long time ago I was watching an episode of the Barefoot Contessa and she was making chicken salad. You know, preparing for one of her fabulous picnic lunches at the beach with her guy friends or playing bridge with the boys, drinking champagne cocktails and eating homemade blinis with smoked salmon… I want to be her. Who wouldn’t love her life? Anyway, she was making chicken salad and had this genius method to make the chicken. Whole bone-in chicken breasts, rubbed with a little olive oil, salt and pepper and roasted in the oven on a sheet pan. Perfect every time. I stole that method for my chicken salad here. I’ve seen many chicken salad recipes that call for poaching the chicken. I just can’t deal with the chicken simmering in water thing. Smelly, but happy memories of the apartment building my great-grandmother lived in has me scarred. For some reason it always smelled like boiled chicken. Is that a Jewish thing, boiling chickens? Oy Gevalt! I also don’t always love the rotisserie chickens pre-made from the grocery store, though I know they can be a great shortcut. 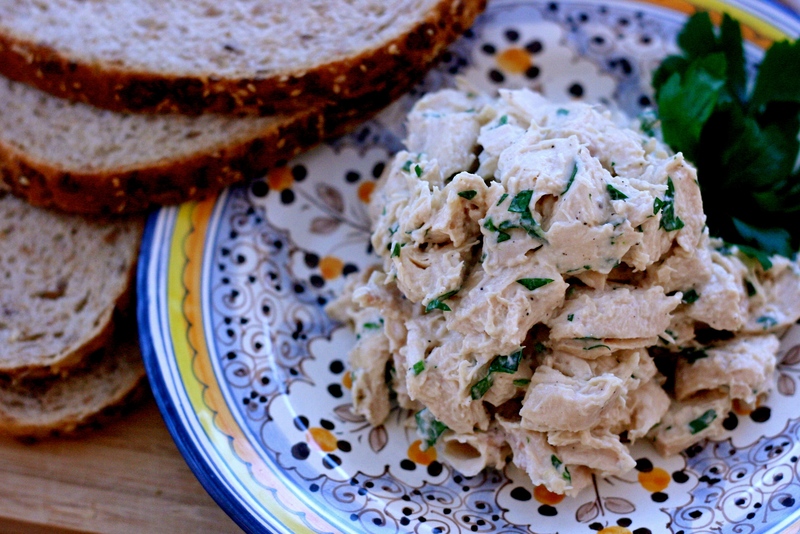 So this is my solution… successful every time, from scratch, super simple chicken salad. You can make chicken this way to toss in salads, like a cobb salad or chicken Caesar salad, or for any other recipe that calls for cooked chicken breast. 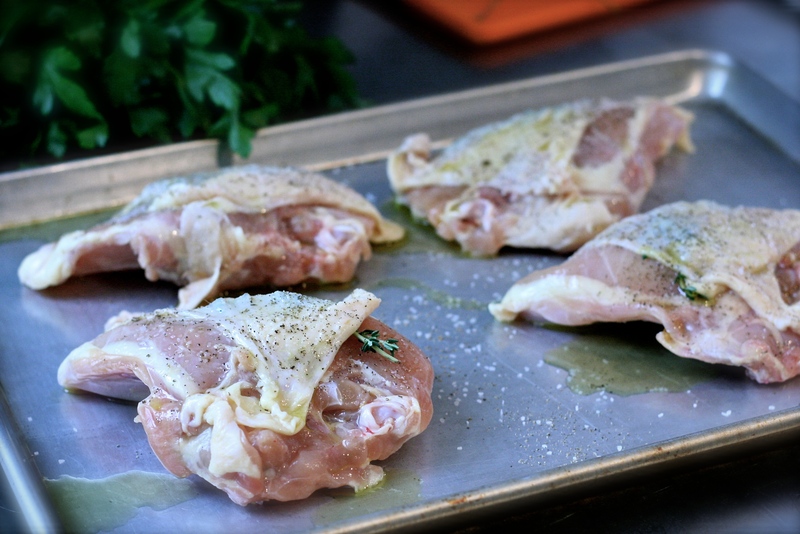 Place the chicken breasts on a sheet pan skin side up. Loosen the skin gently on each breast and tuck a small sprig of thyme under the skin. Drizzle a little olive oil over each one and sprinkle kosher salt and pepper on each breast. Using your hands, rub it evenly all over the chicken. Place the sheet pan in the oven on the center rack and roast for about 35-40 minutes depending on how big your chicken breasts are. I use a meat thermometer and check them at 30 minutes. They are done when they reach 165 degrees. 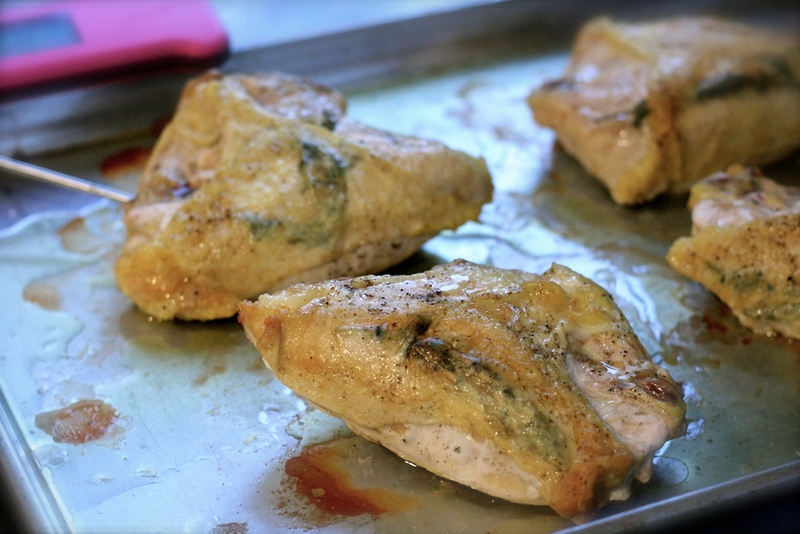 Once the chicken is cooked through, remove the sheet pan from the oven and set it aside allowing the chicken to cool completely. When they have cooled, remove the meat from each chicken breast, discarding the bones and skin. Cut the meat into large bite sized pieces. 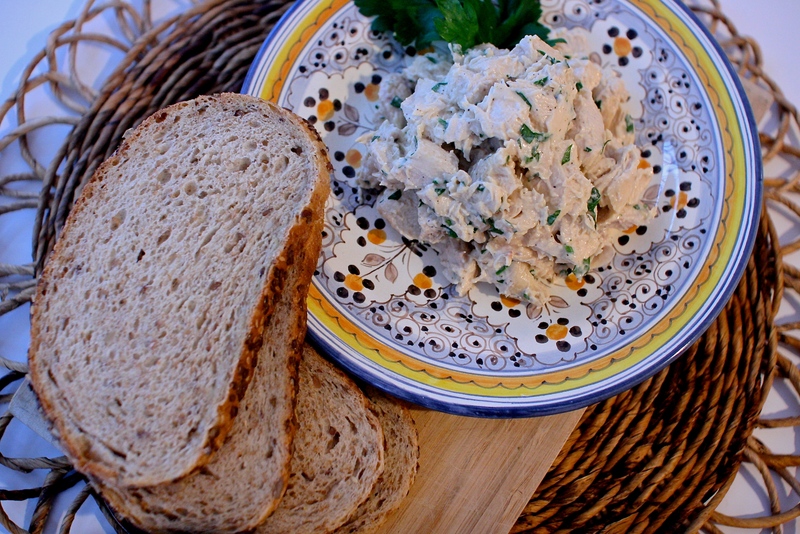 In a large bowl, place the cubed chicken with the mayo, chopped parsley and Dijon mustard. Stir well to combine and season with salt and pepper.